The focus of the Basic Training is to expose students to the prenatal and birth material, the foundations of healing shock and trauma, and to gain a basic comfort in working therapeutically in warm water. Attention is given to the personal journey and growth of each student and to teaching skills that a student can incorporate into his or her practice. 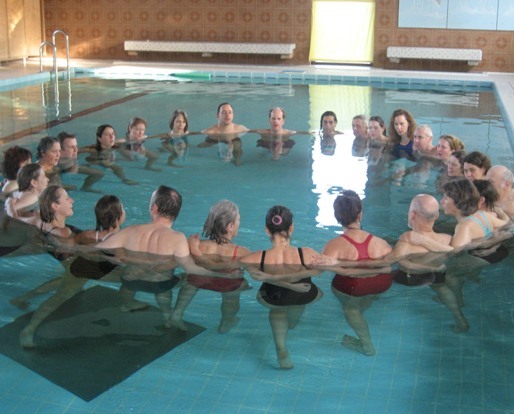 A prerequisite is a week of instruction in an aquatic bodywork modality such as Watsu or WaterDance. In this 5–day workshop, students explore prenatal life from conception to birth. Using movement patterns in the water, the life of the prenate is explored – from a single cell, to an “inchworm”, to a fully developed infant. Talks and meditations deepen the emotional understanding of each period. These include such themes as separation from the Divine, incarnation shock, attachment to the uterine wall, bonding issues, umbilical toxins, the loss of a twin, and many others. Students learn to release these prenatal shock patterns from the body tissue and to support the healthy unfolding of the authentic Self. People find this workshop to be a powerful and healing journey. In this 5-day workshop, the birth process is explored. Using the healing properties of warm water, students are given the tools and support to navigate and resolve difficult birth experiences. Themes are covered such as the use of forceps, anesthesia, induction, cesarean sections, pre-maturity and others. Healing birth trauma clears the way for healthy bonding and attachment. Many find a greater level of connection, intimacy and safety in their relationships. The prenatal period is a time of great psychic openness. As the mother and father prepare for birth, the sights, sounds, smells and hormones of pregnancy can stir the unconscious memories of the parent’s own birth history. In this way, traumas from long ago can be passed from generation to generation. This might include the trauma from past wars, family patterns such as divorce or an affair, the birth order of children, or unconscious gender roles. These patterns affect the parent’s ability to attach and bond as well as the energetic field in which the baby’s tissue and organs are developing. This module is a weaving from the ancestral to the physical as students learn the therapeutic presence necessary to hold these family stories with compassion and skill. In this module, students gain a greater understanding of the psychology and transference dynamics that occur throughout a session. When a client is reliving memories of abandonment, for instance, a therapist responds differently than if the client is feeling inundated. Likewise, issues of shock and dissociation require a unique set of skills and pacing. The same is true with themes of merging and co-dependency. This early psychology helps a therapist to adjust the quality of touch, the physical distance, the tempo, and the therapeutic presence. A safe container is created in which deep empathy is balanced with empowerment and healthy self-development. Early wounds can heal allowing more satisfying and fulfilling adult relationships. Students learn to track trauma and health in the fluids, organs, glands and nervous system of the body. Students learn to feel the healthy potency, or breath, of the cerebral spinal fluid, interstitial fluid, synovial fluid, lymph and blood. This fluid potency deepens one’s ability to feel the health and vitality of the organs, glands, and nervous system. With this heightened somatic awareness, students are better able to track negative chemical and energetic imprints. This might be alcohol or smoke that was transmitted through the umbilical cord, or anesthesia from birth, or generational patterns that have lodged in the body tissue. This module deepens a student’s ability to track these different body systems and to allow these negative imprints to breathe and release. Students learn to track potency and trauma in the muscles and bones. As an example, student’s learn to track the dynamics of birth and of how compressive forces can be imprinted on the baby’s cranium and torso. Conjunct points, pathways and maternal pelvic shapes are learned. The psychological dynamics of birth are also explored with special emphasis on future relationship patterns. As always, this is done with a backdrop of health and potency. With the healing of prenatal and birth injuries, more presence, aliveness and heart is available for intimate relationships. In this module, students learn how to stay empowered and present with themselves, while connecting with another. Energetic and generational blocks to intimacy are released. Based on the interest of the class, topics may also include conscious and empowered sexuality, fertility counseling and aquatic therapy, working with pregnant moms and dads in the water, aquatic therapy as preparation for birth, and infant aquatics. Brining it all together. Students learn models of various kinds of Integrative Aquatic Therapy sessions. Emphasis is placed on strengthening verbal therapeutic skills. Special topics and professional development themes are discussed. Students present final projects and celebrate the completion of the training. Compliance with local laws for field of practice. Final Project due at last class. Option A: Write a paper about your journey through the training from a therapist’s perspective. Option B: Review a client you have been working with from a therapist’s perspective. Give 10 Sessions. Can be trades with other students or outsdie client. Write 1 page summary of 5 sessions. One session is taking a genogram or Primary Scenario. Demonstrate competency as an IAT Therapist.